A 10-year-old boy identified as Jorge reportedly rejected a girl he had a crush after she had made fun of another girl in the class. 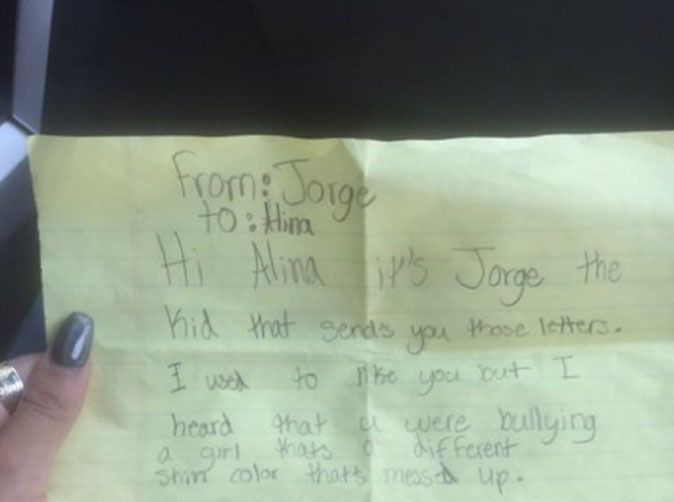 One Twitter user shared a note that she says her mum confiscated from Jorge to his crush, Alina. Twitter user Drama Queen E (@emeraald_) on May 9, 2017, wrote "So my mom is a fourth grade teacher, and she took this away from one of the students today"
He's been sending her regular letters but after hearing Alina diss someone's skin colour, those letters are coming to an end. 'Hi Alina, it's Jorge – the kid that sends you those letters,' he begins. Of course there have been doubts raised as to the legitimacy of the letter.